Hi there! Not too long ago I told you what I think about Positively Fruity’s body washes. And now that I’ve tried the matching body lotions, I can tell you what I think about these products as well. So here they are – Positively Fruity Smells Like Sunny Strawberries, Smells Like Wild Cherries, and Smells Like Tropical Showers. These body lotions share a few qualities – they all contain glycerin and aloe leaf juice which is nice. They’re a bit sticky, but they leave my skin moisturised for hours. Now let’s get to the scents! Smells Like Sunny Strawberries hardly smells of anything. If you look for a body moisturiser with a long-lasting strawberry scent, look elsewhere because this isn’t it. Compared to the lovely body wash, this body lotion is quite a let down. Smells Like Wild Cherries smells faintly of cherries. I was hoping this lotion would smell gorgeous – but the cherry scent is hardly noticeable. It’s better than the strawberry lotion, but unfortunately that doesn’t mean much. In terms of intensity, Smells Like Tropical Showers is the best of the three. However, the scent is still quite faint. And if I hadn’t tested the other two lotions first, I’d probably complain about the lack of fragrance in this lotion. Hi there! 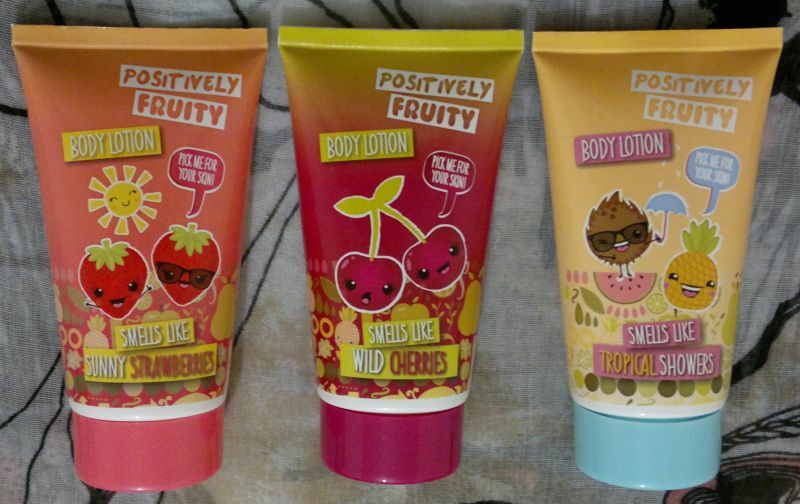 I found these super cute looking Positively Fruity Body Washes at my local Poundland the other day. The tubes were sealed, so I couldn’t have a sniff. But they looked so cute I just had to have them! I found three fragrances – Smells Like Sunny Strawberries, Smells Like Wild Cherries, and Smells Like Tropical Showers. Smells Like Sunny Strawberries smells sweet and fruity – like sunny strawberries! I think the strawberry fragrance is quite authentic and not overpoweringly sweet. Very well done! Smells Like Wild Cherries is my favourite of the three. It really smells of wild cherries. Again, very authentic. And much better than higher end products costing ten times as much. This one’s going to be a definite spring and summer beauty staple! Smells Like Tropical Showers is sunny, sweet and tropical! It reminds me of gummy bears and jelly beans – minus the sugar. The coconut isn’t very noticeable (I think that’s great). All in all, a very nice and enjoyable fragrance! 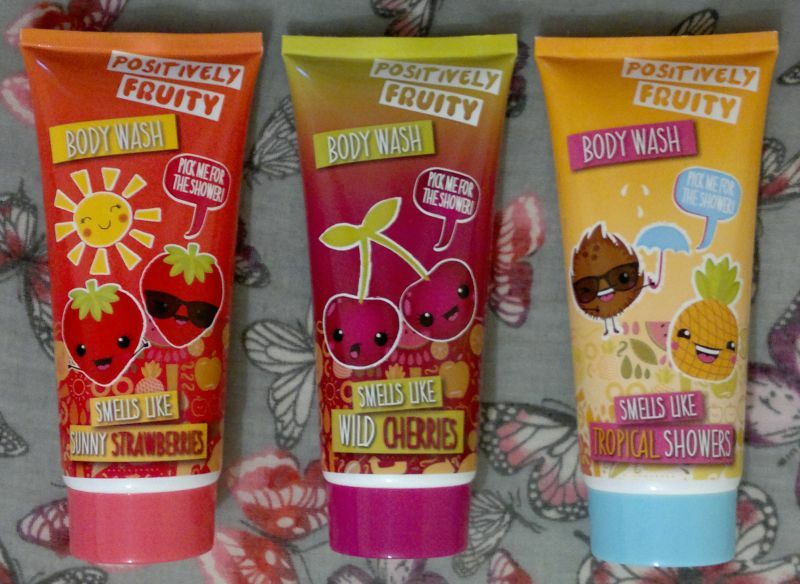 Positively Fruity Body Washes are available as 200ml tubes for £1 each at Poundland. Now my local Poundland has more products from this range – bath salts, cosmetics bags and body lotions. I’ve now bought the body lotions as well, and I’ll try them shortly. So it won’t be long until I tell you what I think about the matching body lotions.